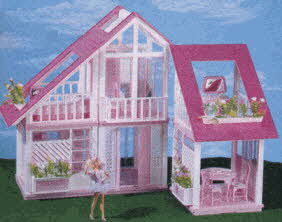 Description This dream house comes in three moveable parts which gives you more space and the option to change the shape of the house, unlike other dollhouses. Comes with all the features you love: windows and doors that open and close, a balcony, and flower boxes with colorful "flowers." Every room is furnished; the kitchen even has a stove and a refrigerator that really holds play food! There are twelve pieces of furniture and over ninety accessories in all. 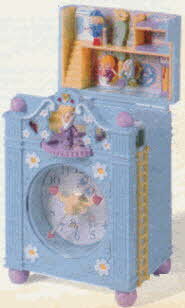 Description Funtime Clock is a real clock that keeps perfect time as Polly Pocket and her friends play on a swing and merry-go-round. Folds easily to go everywhere you go. Comes with four Polly Pocket characters. 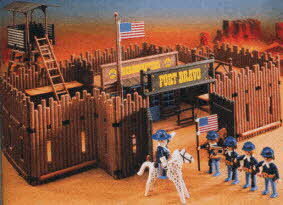 Description This Playmobil Western-themed Fort Bravo set includes the fort with a watchtower, five figures, a horse, and flags. 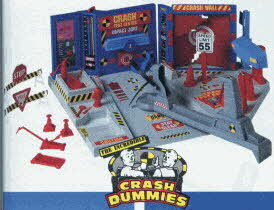 Description The Crash Test Center lets you create hundreds of weird and wacky smash-ups. Includes base, crash wall with impact meter, brick crash wall, "rocket sled" launcher, car front and lots of accessories. Designed for use with all Crash Dummies toys. 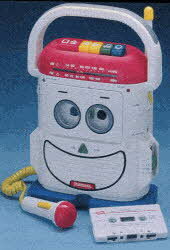 Description The Rockin' Robot cassette player/recorder has AM/FM radio and an attached mike. Kids can record themselves, or the radio. Includes a tape with blank side for recording; Joanie Bartels' songs on the other side. Description Teen Talk Barbie really talks! With a push of a button she says four fun phrases about shopping, dancing, activities and school. 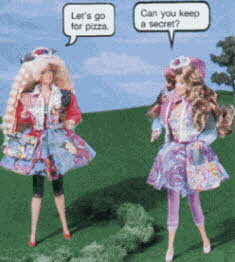 Not every doll talks alike, so your doll could say something completely different from your friend's doll! Her floral print jacket, leggings, chiffon over skirt, and hat are the coolest Barbie fashions; and she comes with two pairs of shoes, a brush, purse, shorts and replaceable batteries. This doll created some controversy in 1992 when about two percent of the dolls were programmed with the phrase "Math class is tough! ", leading to criticism from women academics, after which Mattel no longer used that phrase in the dolls and offered to replace dolls that said it. 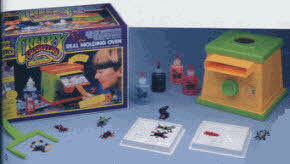 Description Creepy Crawlers lets you make your own gruesome and slimy "Creepy Crawlers". Includes "Magic Maker" heating unit, four 2-oz. bottles of "Plasti Goop" and molds for all your creations. 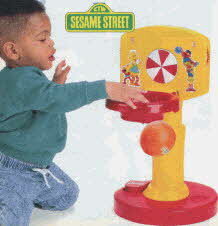 Description This beginner basketball set is made of colorful, durable plastic that adjusts easily to little ones can shoot while sitting or standing. The color wheel spins with every score and a bell rings. There are also two score-keepers. 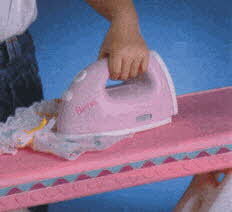 Description The Barbie Press Pretty Iron really warms up so you can iron your own clothes and your doll's clothes too. Comes with a t-shirt for Barbie that magically changes color when ironed. 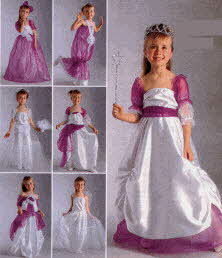 Description Be an angel, bride, princess or junior prom queen with this dreamy clothes combination. Ensemble includes dress, skirt, 2 sashes, purple sleevelets, white sleevelets, net skirt, veil and wings. 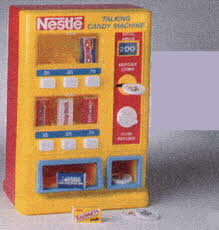 Description The Nestle Talking Vending Machine plays one of six different phrases each time a play coin is inserted. Real miniature candy can be substituted for the play candy that is included. Description Set depicts the energy and activities of an English-style riding stable. Eight horses and riders are posed for jumping, galloping and standing. Plastic stable has four horse stalls, Dutch doors and tack room. Description This Indigo Bunting Babydoll is showing off her new bottom teeth. 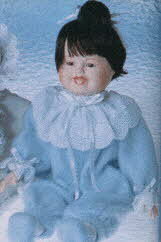 She's wearing soft cloud blue pajamas trimmed with lace and ribbons. Matching bunny slippers keep her toes toasty. Teething Time Comes with a pacifier. Description This electronic super car has authentic styling and realistic sound effects for wheel fun. Kids can turn the key to rev the engine, roll the wheel for engine sounds, spin the steering wheel for a tire screech, and push the horn for a honking blast. And, if they crash into an object with the bumper they'll hear the sound of sudden impact. Working doors and pop-up headlights. 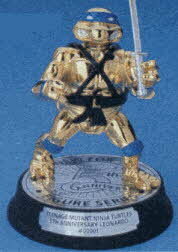 Description In honor of the fifth anniversary of the Teenage Mutant Ninja Turtles this metalized and magnificent toy features Leonardo in gold-colored plastic standing on a deluxe manhole base and silver-colored Katana blades. 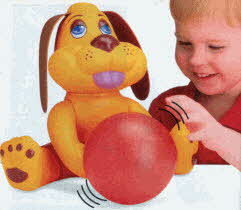 Description Catch n' Roll Puppy actually plays catch with your toddler! Just roll the ball to him and watch him return it. Motor prepares paws for the next catch. Description The Cool Cookin Frying Sauce Pan Set by Color Magic has all the fun of the real thing. It safely "cooks" play food with ice water: child controls "boiling" action by touch of a dial. Plus, Color Magic Cooking makes food change colors for realistic cooking action. Complete food and service for two includes high range sauce pan and cover, spatula, knives, forks and plates. Play food includes 2 potatoes, 2 sausages, 2 lettuce cups, 1 chicken and 1 shrimp. 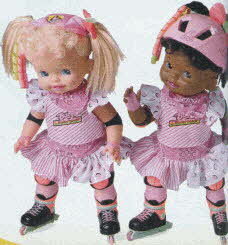 Description Baby Rollerblade really cruises on her official Rollerblade skates! Watch her head, arms, and legs move. Description Wild and frantic fun! 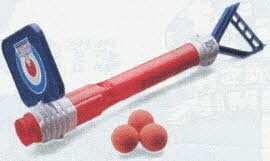 Plunger action cannon rapid-fires foam balls. Includes three balls and cut-out target. 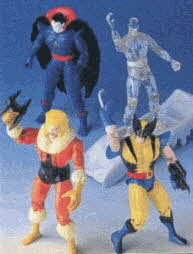 Description X-Men themed Marvel Superhero 4-pack includes Mr. Sinister, Iceman, Sabretooth, and Wolverine II. Includes comic book and accessories. 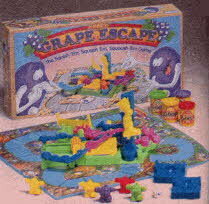 Description This great hands-on game begins with making the grapes out of Grape Goop. Start the race, but don't roll "Crank" or it's into the mashing, flattening, sawing, snipping Jam Maker and back to the Goop stage! For 2 to 4 players, ages 5 and up. Description Ultra-fast racing and speed stunt competition! 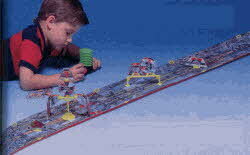 Streak under obstacles and blast through targets. Includes vehicle launcher and ten and a half feet of track and targets. Description Dress up like one of the most popular Joes! 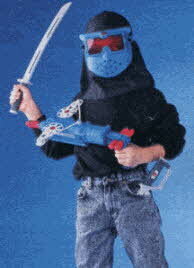 Includes crossbow that shoots soft vinyl darts, authentically styled Ninja hood and mask, Katana sword, throwing stars and battle knife. 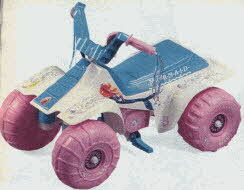 Description Mermaid Barbie themed Power Wheels vehicle includes hand throttle for battery mode or fold-up foot pegs for pedaling. Comes complete with shell-shaped "phone" and glitter tassels. 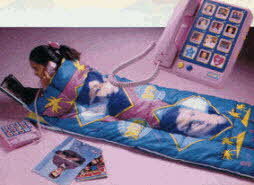 Description Beverly Hills 90210 themed slumber bag unzips to become comforter. Girl Talk Photo Dialer Telephone features adjustable volume, call and redial buttons, tone/pulse switching and memory lock. Includes 12-digit large window memory keypad, is hearing aid compatible, had high or low ringer switch, and can be mounted on a table or wall. 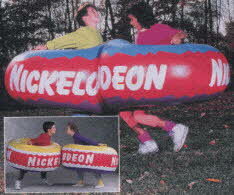 Description The Nickelodeon Belly Bumpers are great for bumping into friends! Also lots of fun in the water or as a sled (not approved for use as a safety device).